Why do cheeses go on sale? Well, sometimes they are reaching the end of their ‘useful’ life but are still good to eat. In other words, they are good right now, but may not be in a week or so. Another more common reason is that we’ve got too many of one kind and want to move them before they reach their ‘end date’. Lastly, sales are always a good old-fashioned way to get customers into the store! So if the cheese you want is on sale, ask your cheese monger what the reason is. Keep in mind that if the cheese is really only a few days from being passé then you will want to buy small amounts. Finally, insist on tasting a sample before buying. Tough economic times are impacting everyone these days and I feel myself starting to double check prices and asking, “do I really need this”? But this cheesaholic has got to get her cheese on, and I want to assure you there is a way to do it (relatively) guiltlessly. Only buy what you can eat today. The biggest money waster when buying cheese is buying too much and having to throw old cheese away. If you’re buying cheese for you and some lucky person to share over a meal, a ¼ pound is plenty (and is usually the minimum quantity a cheese monger will permit). If you are entertaining a group, figure two ounces per head per cheese as a general rule of thumb. Evaluate cheese prices across a category. If you are craving blue cheese, for example, look at the range your cheese monger has on offer within the blue family. The differential can be $20 per pound or more for a given cheese type. So try the low end first and if you like what you taste, then you’ve just scored yourself a deal. Make good use of multi-purpose cheeses. Again this plays into the “waste not, want not” thought. Harder cheeses like Gruyere and cheddar last longer, and because they are so versatile you’re less likely to have leftover cheese sitting in your fridge. Think of cheese you can add to sandwiches, soups, and pasta. And because they are considered to be “everyday cheeses”, there are great quality versions for $12 per pound or less. I hope these tips encourage you to keep your cheese consumption up, and take some heat off your bills. Tough economic times mean many cheese makers might go out of business this season. But let’s hope that those that survive view it as an opportunity to distinguish themselves from the masses by making really great product at great value. If you have great cheese deals to share, please post them below! I came back from a two-week vacation to Greece with one lingering thought on my mind – how soon I could get my hands on a decent supply of feta. If you have ever visited Greece you will know that this pristine white national treasure appears on every taverna menu, drizzled with olive oil, or generously heaped on horiatiki salata (Greek salad). I ate it twice a day or more and never tired of the tanginess and flavors of olive and ocean in every gorgeous bite. Feta cheese is most closely associated with Greece, but other countries in the region, Bulgaria and France in particular, have delicious versions of their own. French feta is milder, and Bulgarian feta packs a bigger punch. Feta has become so popular around the world that the majority of what we consume is industrially made. Small-batch artisan versions can still be found in the country (and likely not much beyond the village) of origin. Feta tastes best to me when made with sheep’s milk, though there are plenty of tasty cow and goat’s milk versions are out there. The fresh milk is left to curdle with rennet and a starter culture, and the curds are then ladled into molds lined with cheesecloth. After a few weeks of draining and salting, they are firm enough to cut into blocks, and are submerged into a brine or salted whey solution to cure and age for a month or more. Think of feta like a pickled cheese! Feta has a long shelf life for a fresh cheese, so I usually buy a block from the supermarket without worrying too much about when I might get around to eating it. I’m also a fan of the feta cubes suspended in olive oil and dried herbs – they make a great snack or easy hors d’oeuvre, and the leftover oil tastes good drizzled over salad. However you like your feta, be sure to revisit it often this summer. 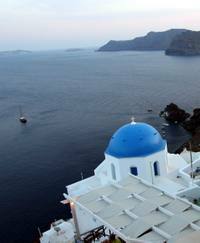 Then throw on your bouzouki CD and break open the retsina, and welcome to my big fat Greek vacation. Goat’s milk cheeses are refreshingly mild and widely available during the summer time. Fresh chèvre logs covered with peppercorns or herbs make for a pretty presentation and are always a crowd pleaser. 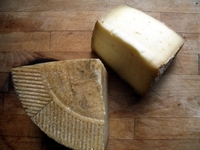 Pressed sheep’s milk cheeses (like Manchego from Spain) are great for summertime – just be sure to let them reach room temperature before cutting them. This will help reduce the “weeping” of the fat from the cheese. If you are barbecuing, dress up your burgers with a great farmstead cheddar, like Fiscalini Cheddar from Modesto, California. And keep a hunk on the cheese plate for people to graze on between burgers. Enjoy your summer, enjoy your cheese. Everything about Valentine’s Day screams “hearts” – they are all over the place, splashed on every card and gift intended to convey the subtle expression of love. But why, oh why, did the heart-lovers have to mess with cheese? I never understood this idea, and am even more perplexed in realizing this is probably a fairly old thing. According to my sources, the heart-shaped cheese hails from France. The French are pretty traditional about their food, especially cheese, which leads me to believe this notion has been around for a while. I can only imagine, a century ago, a lonely French cheesemaker pining for the lovely maiden that frequents his cheese shop. Unable to summon the courage to tell her how he feels, he whips up a heart-shaped Camembert and presents it to her, hoping his intention is loud and clear. Ah, l’amour. I personally have never tried a heart-shaped cheese. But for those of you willing to take the plunge, there is plenty to chose from: Coeur de Berry, Coeur d’Arras, Coeur d’Avesnes and a few American versions as well. Remember, you can always get out your heart-shaped cookie cutter and take it to any cheese you like (maybe you’ll get points for being creative too). When I first got into the habit of purchasing serious quantities of cheese, I often ran into the “problem” of having to consume it all, and quickly, before it turned on me. My preferred cheese suppliers are my in-laws, and when they would visit from Spain I often received a whole wheel of Manchego cheese. We would eat the cheese, tapas style, for days, and grate a little here and there over pasta, but no matter how much we chipped away at the block, I was invariably facing an inventory overload. So where did I go wrong? Well the first sin was in grating the cheese well in advance of using it. 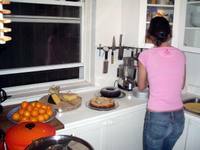 Cheese should be grated to order, and once grated loses much of its luster within a few hours. Second, I resorted to freezing, with no real plan of action to use it within the next few days. Freezing and thawing cheese stresses the cell structure of the fat and protein cells, and at best results in weird textures (very grainy or flinty cheese) and at worst can result in rancid cheese. If you must freeze cheese for later use, freeze small amounts, and keep the chunk intact. Make sure the cheese is wrapped tightly (if the cheese has freezer burn throw it out! ), and do not freeze soft or semi-soft cheeses. These cheeses were not meant to last forever and with higher water content are more susceptible to rancidity or extreme textural changes. Bottom line? Buy what you can consume, my Cheesaholics. Yes, it’s nice to have a “stash” for emergencies, but with enough planning and trips to a reputable cheese-monger you can have your cheese fresh and freezer-free at all times. I adore hosting parties. Last weekend I threw a birthday party for my friend Luis, and spent the better part of a day cooking for it. But the pièce de résistance no doubt was the cheese plate. OK, so my friends expect a lot from me when it comes to incorporating cheese in my entertaining. But seriously, why don’t more people think of it as standard? It was the easiest, most stunning and arguably tastiest treat I had to offer. The first step was making a trip to the Essex Market to visit my friend Anne Saxelby. I planned on buying an impressive amount and knew I wanted three cheeses (an odd number looks better on the board). I picked out one stinky, one smoked, and one blue, all happened to be from Vermont (Twig Farm Wheel, Maple Smoked Gouda, and Bartlett Blue, respectively). 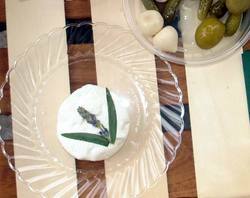 I went by cheese-making style and appearance, so that each cheese brought with it a whole new experience. Once home all I had to do was remember to take them out of the fridge 1.5 hours before serving, arrange them on a board, and stick a label in them (I love the ceramic labels that you can use over and over). And just like that I had a stunning addition to the dessert offering (check out the spread in the photo). The cheese got a lot of attention, and it was great to have something salty and fatty to snack on as we ploughed through the wine. Anyone can entertain with cheese, and maybe you’ll give it some thought too. And if you need help, I’m here for you fellow my cheesaholic, so drop me a line. • Stick to dry wine. Nothing kills a fondue like sickly sweetness, so steer clear of sugar-heavy or dessert wines. Rosé wines go nicely but keep in mind you’ll end up with pink fondue (which may or may not turn you on). 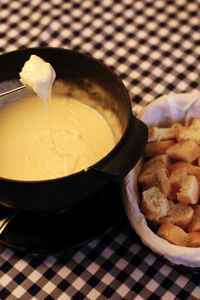 You can even try substituting dry Champagne, apple cider or beer for the wine in your fondue recipe. • Meltability is key. Keep in mind that you want a good melting cheese. Stay away from sheep and goat’s milk cheeses unless you’re very practiced at fondue making. Alpine style cheeses, cheddars and really any pressed cow’s milk cheese, all make great fondues. Softer cheeses like Brie are scrumptious (remember to remove the rind), but I would avoid triple-crèmes as the fondue can end up too heavy. • Taste everything first. Try the cheeses and wines you want to blend before you throw them in the fondue pot. If they clash from the start, they’re not going to get any better when melted together. Some interesting combinations are Brie and blue cheese (try blending with a dry Champagne), all-cheddar (try different lagers or ales), and all-blue cheese blends (try Stilton with a dry Sauternes). When it comes to dipping, my favorite is plain country bread. I also love beef tips (order them with a fondue at Artisanal Fromagerie & Bistro one day and you'll see what I mean), and green apples. Boiled fingerling potatoes are also tasty and are easy to make. This entry was developed with Danyelle Freeman, aka Restaurant Girl.